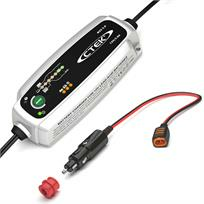 CTEK MXS 3.8 12V Battery Charger & Cigarette Lighter Adapter Kit. The new generation CTEK MXS 3.8 combines all the benefits of a battery conditioner with the power of a conventional charger, charging your battery quickly and easily without the need to disconnect it from your vehicle. The MXS 3.8 offers faster charging times and two diagnostic steps to test if the battery can take and then hold charge. An advanced microprocessor controls the patented Float/Pulse mode which makes it the ideal choice for long-term maintenance of batteries not in regular use. A great all-round charger, the MXS 3.8 is suitable for a variety of applications including motorcycles, cars, tractors, jet skis and small boats.